Let’s Cherish The Day was recorded at Pepperbox Studios and produced by Kristina Stykos and Phil Aaberg; mixed by Kristina Stykos and Colin McCaffrey at “The Green Room” in East Montpelier. The track was mastered by Corin Nelsen and Scott Ainslie at Imaginary Road Studios. "I was happy to participate in Care For All because the health care dilemma in this country is outrageous and criminal due in part to the real pandemic: greed. Change is coming and music will continue to be part of the healing process if it reminds us of our ability to change and move our hearts more strongly into all aspects of life." "I'm always interested in expressing the duality of being alive. Each of us is a rich complex of personal history but, in the moment, we connect through simple things like the everyday wonders of the natural world. " 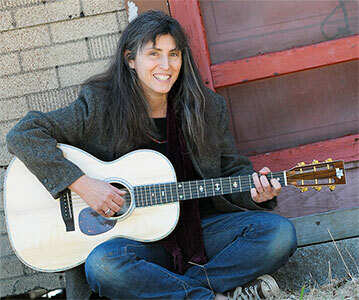 Kristina Stykos is a songwriter, recording engineer and gardener from central Vermont. She began writing songs in the fourth grade and says that her guitar has been her best friend through good times and bad. Her compositions give voice to commonplace but often privately held emotions and feature her unique outlook as a rural homesteader, recovered single mother, closet philosopher and troubadour. Spurred on by a "Best Vermont Album of 2005" designation by the Times-Argus for her release "In the Earth’s Fading Ligh", Kristina returned to school for audio production. She now owns and operates "Pepperbox Studio" in Chelsea, VT, an off-the-grid recording and production studio at the end of a dirt road.